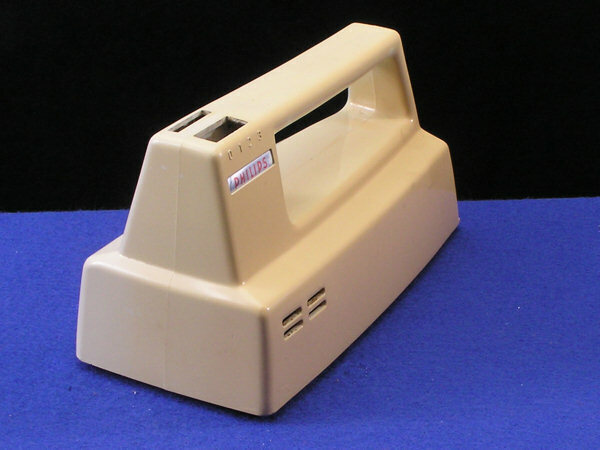 In summary, a group of vintage computer enthusiasts have developed a means of reversing the fading in ABS plastic caused by exposure to daylight. They state that the cause is a reaction of the the bromine-based flame retardent. 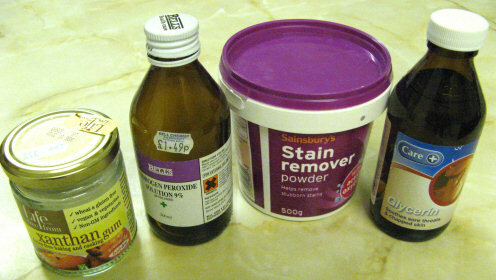 The technique uses a commonly available domestic oxygen bleach powder to catalyse a reaction with hydrogen peroxide under the influence of ultra-viollet light. The active ingredient in the bleach is a substance called TAED, tetra acetyl ethylene diamine. This could be a boon in restoring some of my collection which has faded badly in sunlight. I decided to make a trial. I managed to locate the ingredients after some shopping around on a Monday. Boots chemists didn't stock Hydrogen Peroxide and suggested I try one of the independent pharmacies. The second pharmacy had glycerin in stock but not peroxide. A lady waiting behind me recommended a third shop where her father buys peroxide to bleach his dentures. The first health food shop didn't stock Xanthan gum and I had to ask the assistant in the second shop as the gum was well hidden in the display. 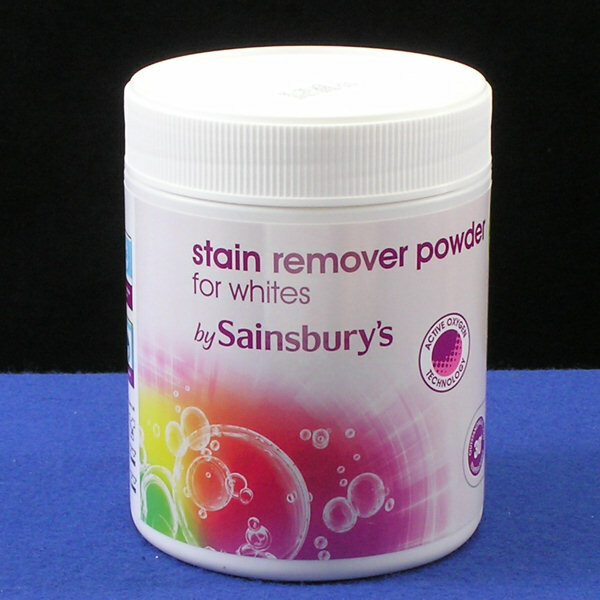 We had some Sainsbury's stain remover in stock at home already. With hindsight I should have experimented with the gum before mixing the gel. I was only able to buy hydrogen peroxide in a 9% solution and the bottle was 200 ml. The recipe used two heaped tablespoons of gum in 500 ml of peroxide. As I had only 200 ml I guessed that one level tablespoon would be the right proportion. I followed the mixing directions but I was startled to discover how stiff the gel became almost immediately. I stored it in an old drinking chocolate tub suitably labelled. The subject I chose for the experiment was an old Betacom Horizon which had faded fairly badly. 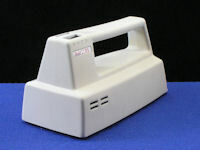 The photos of the test pieces were all taken under identical controlled flash conditions in order to make the comparisons valid. Click for a larger image and use Back to return. I decided to work on only the base unit, which has no internal components and is simply an anchorage for the cord. You can see that the indented sections where the handset fits have hardly faded at all and can be used for comparison. I removed the metalwork and cord grips prior to treatment. The Oxy stain remover must be mixed into the gel before it is applied. This proved difficult as the stain remover is quite granular and does not dissolve easily in the cold. The process was made even more difficult by the relative stiffness of the gel. For these reasons I think the early mixes were not effective. The process calls for the subject to be exposed to ultra-violet light. I decided to try to use my UV exposure box which is designed to expose printed circuit boards. 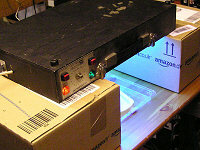 Here it is in action turned upside down on two cardboard boxes in my loft. The problem was that the timer can only be set to a maximum of 15 minutes. Without dismantling the box I could not turn it on continuously. I found that the gel dried out pretty quickly and it became necessary to re-coat the test sample. As a result of the exposure problems and the need to recoat, I decided to resume the trial outdoors on Tuesday using daylight as my ultra-violet source. 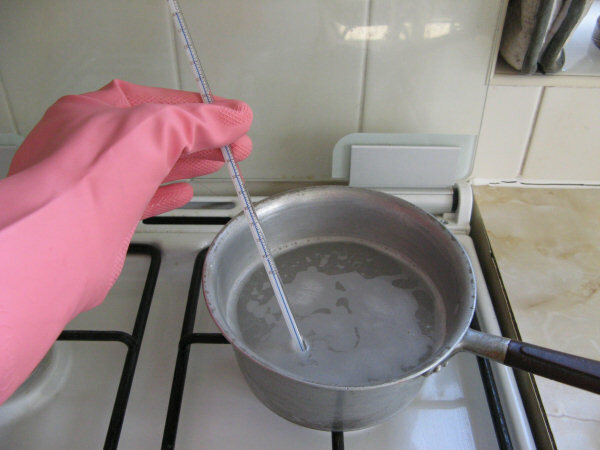 In order to improve the mixing of the Oxy stain remover, I used a simple bain-marie, by lowering the small metal dish into a bowl of hot water which softened the gel suitably. Only a few grains of the stain remover are needed and by stirring vigorously with a spoon I made this frothy mixture which was much easier to spread on the test piece. Adding a small amount of hot water to the mix improved the texture even further. These tests took place in mid-March when there is a limited length of daylight - by 18:00 the light was mostly gone. In addition I didn't get round to mixing the gel and putting the test piece outside until mid-morning or after lunch and on some days I was busy doing something else. So I estimate that it only got about four half days exposure by Sunday when I rephotographed it. I don't think I'm fooling myself that it's made some improvement. 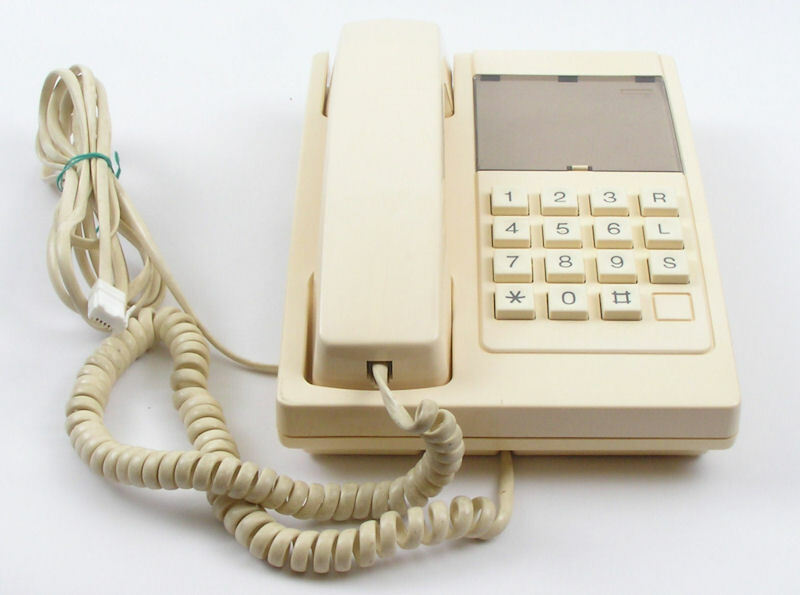 The base unit is definitely whiter than the untreated handset. There is still a contrast in the recesses so there is some way to go before it could be considered totally fixed. I decided to continue with the treatment and perhaps try out different formulations of gel to make it easier to apply and less prone to drying out. The calendar moved on into April with British Summer Time and longer hours of daylight. 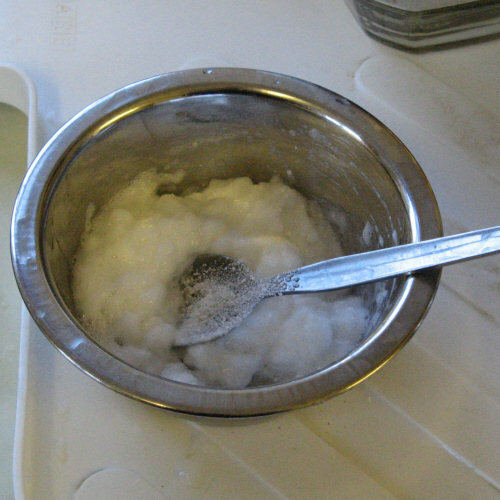 TAED is an important component of detergents and bleaches. Its is an activator for "active oxygen" bleaching agents. Such active oxygen bleaching agents release hydrogen peroxide during the wash cycle. Such agents include sodium perborate, sodium percarbonate, sodium perphosphate, sodium persulfate, and urea peroxide. 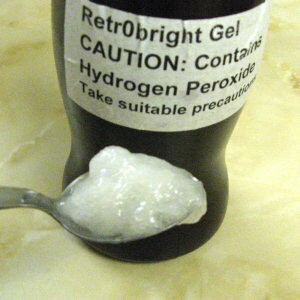 The released hydrogen peroxide is an inefficient bleach below 40 °C, except in the presence of activators such as TAED. suggesting that it contains all the ingredients needed to provide the necessary peroxides without any extra help. So the next thing to try is Stain Remover on its own. I made up a solution of 5 grams of powder in 2 litres of hot water which would half fill a 4 litre ice cream tub. The test piece I used was the top part of the same telephone with the buttons and electonics removed. It's illustrated above alongside its base. When it was dipped in the solution I found it would only fit on its side. Notice that I put a piece of duct tape on it in order to leave a strip of untreated plastic. After a couple of hours nothing much seemed to be happening so I poured out some of the solution and warmed it in a pan to about 80 °C before pouring it back in. I decided that the light was not reaching my test piece properly in the ice cream tub, so decanted the whole lot into a small washing up bowl. You will notice that at this point the duct tape has fallen off, proving that its adhesive is not as waterproof as I thought. I also dropped in the telephone base to see if it would get any better. Unfortunately in my haste to make something happen I also poured in about 20 ml of hydrogen peroxide, rather spoiling the exercise. After about three hours outside in the sunlight, the test piece appeared to have lightened in colour a good deal. I terminated the experiment at this point and once the two pieces were dry I photographed them again. Compare them with their earlier appearance above. The base hasn't got any better for its treatment, but the top part is now as bright as the base - still not fully bright though. The remaining part to become a test piece was the underside of the handset - seen here with its companion before testing. The parts that sit in the base unit are unfaded. The first thing to try was washing powder on its own. 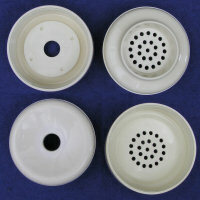 The instructions, scaled down, called for about 50ml of powder in the 3 litres of water needed in the bowl. I used neat hot water from the tap, which is about 60°C. After several hours in bright sunshine I could see no discernable improvement. This may be entirely due to the cloudy nature of the detergent solution which did not allow the ultra-violet light through to the test piece. I abandoned the test at this point and made up a solution of half a measure of the Sainsbury's oxy-bleach, 15g, in three litres of hot water. The test piece stayed out in the sunshine all afternoon. The result seems little different from that produced by the earlier process using a small measure of peroxide. 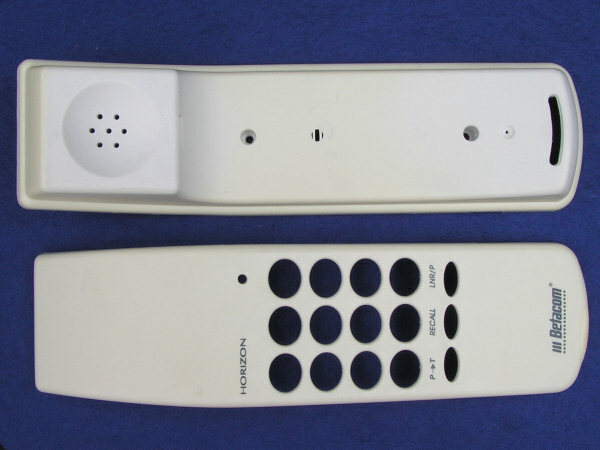 Compare the effect on the two halves of the handset, side by side on the left, and reassembled on the right. The fading can still be seen, but it is much less noticeable. Well, I was a bit sceptical at the outset, but I was pleased to see some increase in the brightness of the test pieces. It wasn't complete whitening, but quite a noticeable improvement. However, the gel process proved to be messy, difficult and no more effective than a wet bath process using just the oxy-bleach on its own. So, at this point I gave the Retr0bright process a qualified approval. I decided that it's certainly worth a try with any items of ABS plastic that are badly faded. You have to be patient: there's no instant fix for browning and any improvement must be better than none. 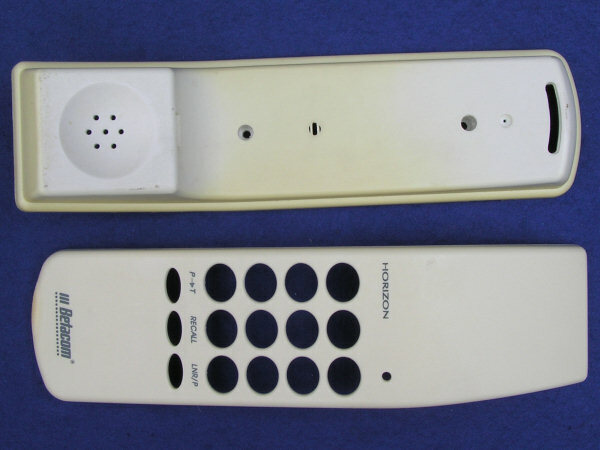 I tried the wet bath process out on an ivory Telephone No 740 which was fairly badly faded. The results were excellent. Unfortunately for the purposes of this page, I found I hadn't photographed it in the 'before' state. 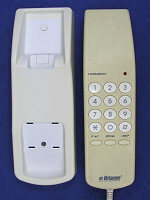 The phone that I remembered photographing turned out to be this ivory 746 [right] which appeared here after I photographed it in 2008. It looks as if it's just come back from a Caribbean holiday. After three and a half days outdoors in a bath of Sainsbury's Oxy bleach, under a mixture of sunshine and cloudy skies, the mouthpiece was fully brightened. The case and dial ring I judged good enough, though not fully bright. 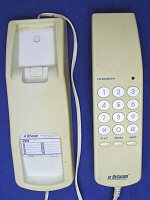 The handset and earpiece were still slightly brown. They sat in a fresh bath of Oxy for a further day in the hope that they'd improve like their fellow pieces. The earpiece cap looked good so I removed it, leaving only the handset for further soaking. I now began to think that maybe I'd over-brightened parts of the telephone. Remember that it's supposed to be ivory and not white. Here's a composite shot of the earpiece and mouthpiece inside and out. It can be assumed that the inside is unfaded. I've been able to compare the mouthpiece with one that's been stored out of light and the colour matches very closely. However, the earpiece under test appears slightly whiter than the mouthpiece and slightly whiter than its underside. The difference is more noticeable in reality than it is in the photographs. Any way here's the final result. 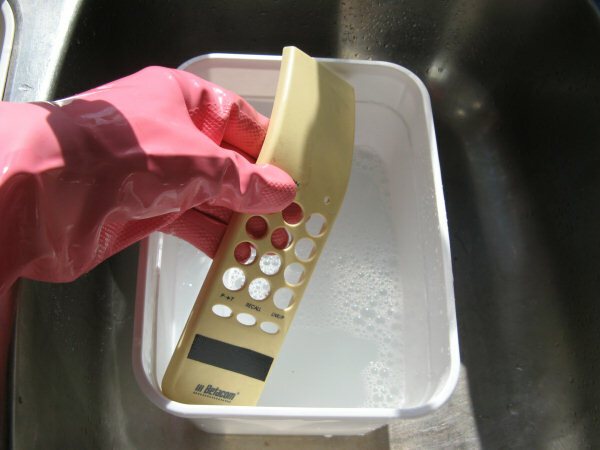 The handset took a couple more days of soaking than the rest, but then it was faded the worst. 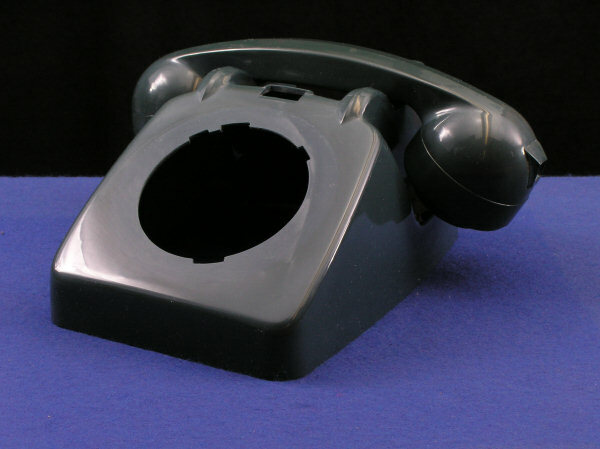 The overall telephone is not absolutely perfect - slightly uneven where the fading has not been entirely removed - and a minor mismatch in colour between the various parts. 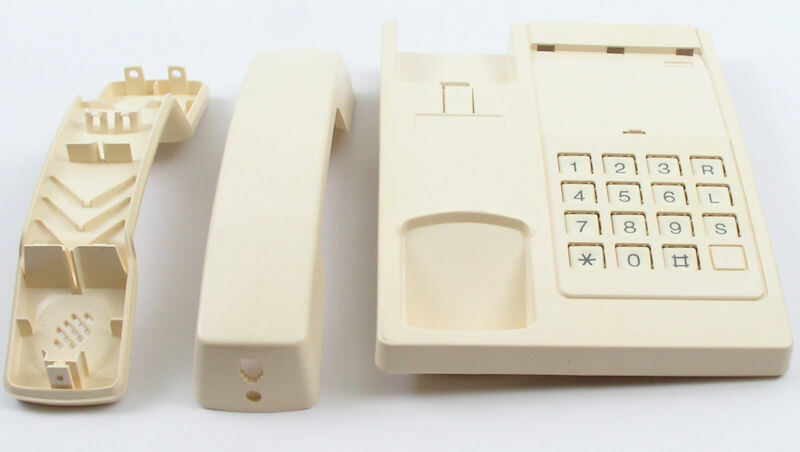 However, remember that the body, dial finger plate, handset and caps might all have been made by different manufacturers and would certainly have been from different master batches of ABS plastic. So, all in all a worthwile improvement. John Baines has written to me as follows. "I used the Vanish version of the product. [I] poured it into two clear plastic containers and dunked in a 706 in one and an Ascom Berkshire in the other. 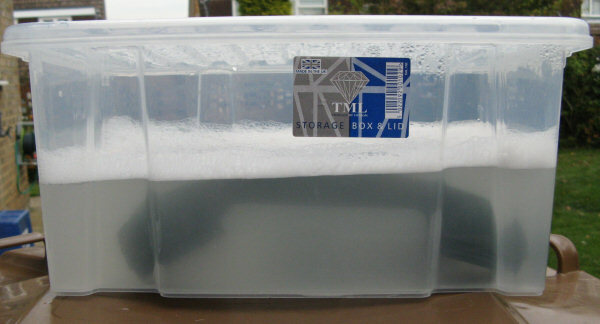 The plastic boxes came from my local pound shop, and so haven’t added greatly to the cost of the process. "Because I was going to be out for the afternoon, and not wanting any small creatures to fall in to their perils, I put clear plastic lids on both of them: and this seems to have worked wonders! The lids have kept the temperature high all afternoon, and the Berkshire is back to its pristine glory already after only about 8 hours. The 706 is well on the way – and I thought it was beyond hope!" Thanks, John. I'm guessing that the lid both prevents evaporation cooling the solution and acts as a mini-greenhouse. I wonder if just cling film over the top would work as well. October now and back to limited daylight. I've acquired one of the plastic boxes recommended by John. 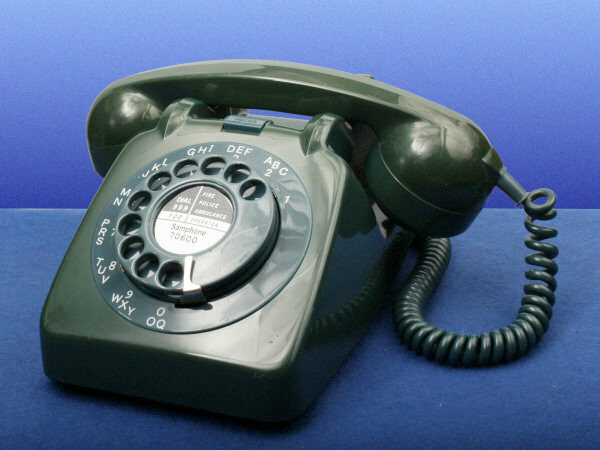 There's some suspicion that coloured items don't brighten up evenly, so I'm testing it with a blue Telephone 706. It was pretty badly faded, so I figured it couldn't get much worse. Picture left shows it as it was the previous year in 2008. Unfortunately I've changed my flash lighting set up since that was taken so the colours don't match exactly with this year's pictures. (Clue: it's the same piece of blue felt) On the right is the handset soaking in the box and sitting on top of my brown wheelie bin in the thin October sunshine. Well, the handset looked better after the first day. I've photographed it on top of the telephone to show the difference. 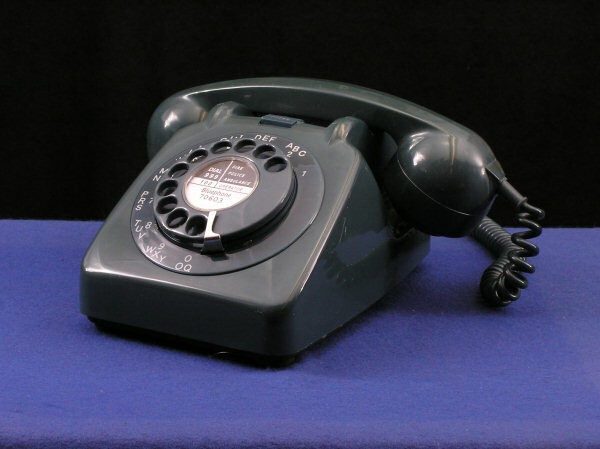 Notice that the dial and outer number ring are not faded like the case. Next The case will go into the box for a soak. The earpiece and mouthpiece look good after a slight polish, but the handset body needs another treatment. There was a slight white bloom on the surface which I polished off. 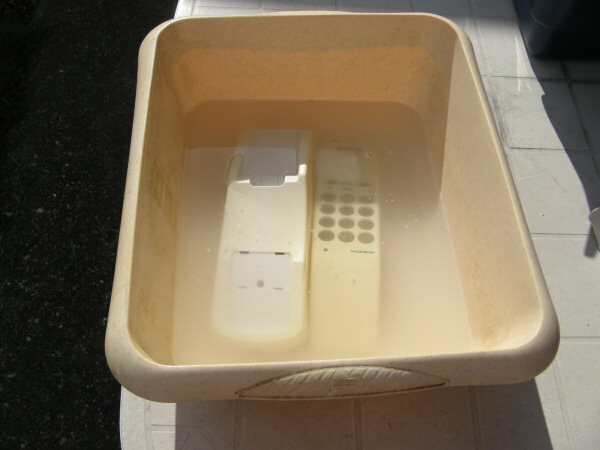 ... And finally: What I judged to be the finished article after the handset had another day's soak. The experiments above took place in 2009. 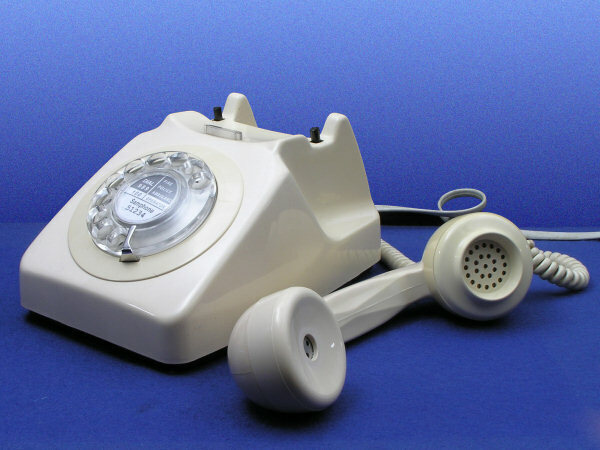 Since then I have disposed of most of my plastic bodied telephones and so have no need of further trials of the Retr0bright process. Interestingly, I found the original telephone used as a test piece which I had been unable to give away. I noticed as I threw it in the bin that it had started to fade back to its original colour, despite having been in the dark for four years. However, in July 2013 we were given a food mixer for use at Church which had suffered fading from sunlight exposure. 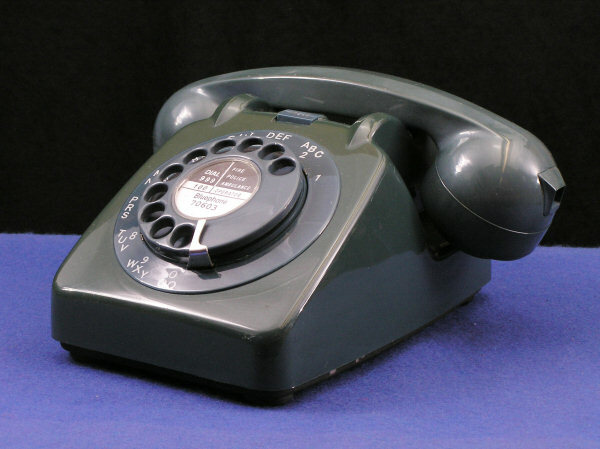 It was a Philips model and must have been of some vintage for it had the old red and black wires in its mains lead instead of the current brown and blue. You can see from the picture (left) that one side is faded worse than the other. 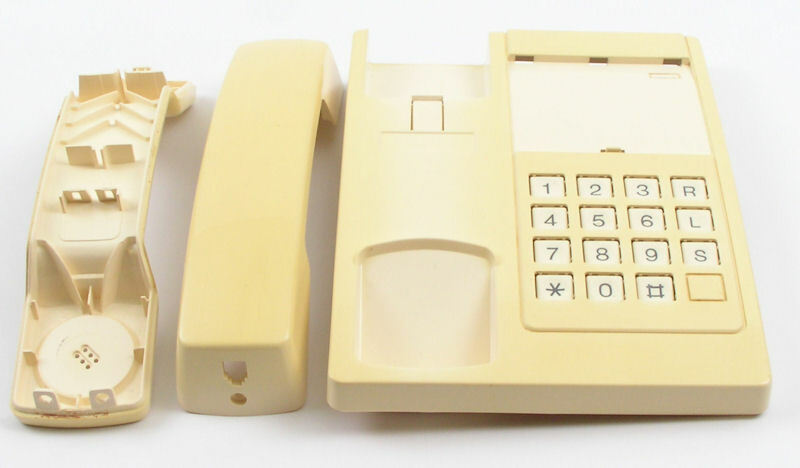 The original colour was cream and the base a sort of mushroom colour. It seemed like a golden opportunity to revive the Retr0bright procedure. Our household detergent usage had emptied the Sainsbury's stain remover and replaced it with a similar product from Arial. After a struggle to find the ingredients I found that it did not contain TAED. A trip to Sainsbury's was called for. Sainsbury's have made changes to their range. There is now a stain remover for whites and a stain remover for coloureds. The ingredients lists on the tub were ambiguous, but my guess that the one for whites (picture right) would contain TAED has proved correct as confirmed by the website. I put 30g of powder into 5 litres of hot water in the Poundland tub acquired earlier. The new formula of stain remover froths a lot. I scraped some of it off, but the chemical reactions produce more bubbles. After a couple of hours the foam had subsided. The sun was pretty strong and the mixer was left out in it overnight and until the following evening. Once it had been rinsed in clean water I photographed it again. You can see that it is considerably lighter in colour all over, but evenly so. It certainly looks like a new mixer. I also cleaned the internal mechanics and oiled the bearings. Once it was reassembled I found that the highest speed setting didn't work. This appeared to be caused by an open-circuit field coil. Never mind, it should still be fine for whipping cream. 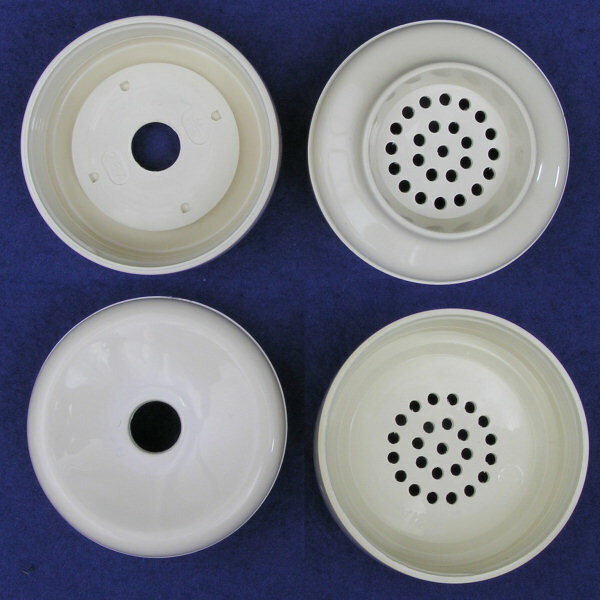 Anthony Pleticos has written from Sydney, Australia, to say that he has found an alternative means of bleaching plastic cases using hair salon crème developer. It's normally used in conjunction with hair dye to re-colour hair. He used the 20-volume (6%) version. "Deionized water, Hydrogen Peroxide, Cetearyl Alcohol, Sodium Lauryl Sulphate, Phosphoric Acid, Ethanol, Methylparaben"
I need hardly add that with those ingredients you should wear old clothes, hand protection and optionally safety glasses when using this stuff. Anthony says he smeared it generously over the plastic and left the item in sunshine for several hours, repeating as necessary. 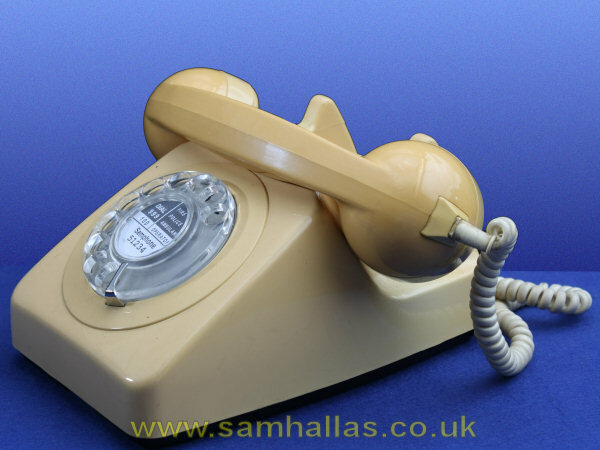 He has had succes with grey, ivory and mustard yellow telephone cases. Anthony has added, "I have also successfully applied hair crème containing hydrogen peroxide to reduce discolouration in Bakelite/Catalin as well as ABS plastics. 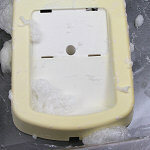 Assuming safety precautions were taken, I applied the hair crème on an ivory Bakelite/catalin BT20/4 terminal box. In conclusion, discolouration can be significantly reduced in Bakelite/Catalin as well as ABS." A web search for "creme developer" found plenty of supply options in the UK at an assortment of prices. Coincidentally, one entry on Amazon even included detailed instructions for brightening ABS computer cases in the very same way. Personally I'd stick with the TAED product. Any excess can always be used in your laundry. I don't need any lightener for my hair. It's sufficiently silver without any artificial help. The process still works. Even with the 4-year-old Sainsbury's stain remover. 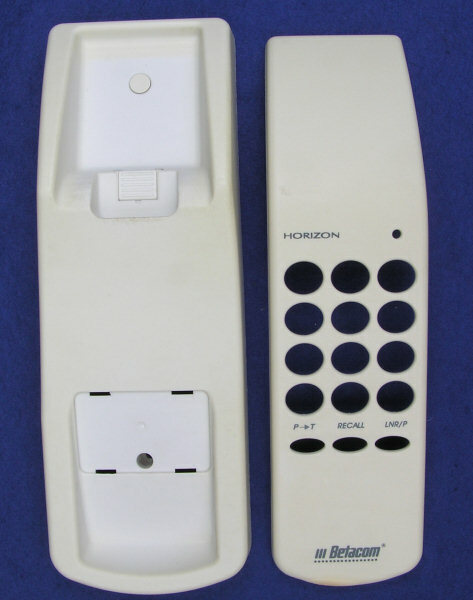 Here are the parts of a BT Vanguard, Tele No 4001AR, recovered from a store cupboard at Church. It was rather dirty, but even after a wash it was obvious that it had faded in sunlight quite a lot. A day in oxy bleach solution in the July sunshine brought it up a treat and the re-assembled item looks nice enough to donate to a charity shop.